The shooting/stabbing death of Labour Party MP Jo Cox on 16 June is the first killing of a British politician since Conservative MP Ian Gow was assassinated by the IRA in a 1990 car bombing. Four other British politicians in addition to Gow were killed by militant Irish republicans since 1979, according to a timeline in The Guardian. The list includes the 1984 bombing at the Brighton hotel, which targeted then Prime Minister Margaret Thatcher and her cabinet attending a political conference. Thatcher escaped, but Conservative MP Sir Anthony Berry and four others were killed. In October 1984, the IRA came close to assassinating her. In 1990, by murdering Ian, they helped to bring her down. If Ian Gow had been slain while protecting Margaret Thatcher, he would have died with a smile on his face. But when she most had need of him, her enemies had ensured that he would not be available. 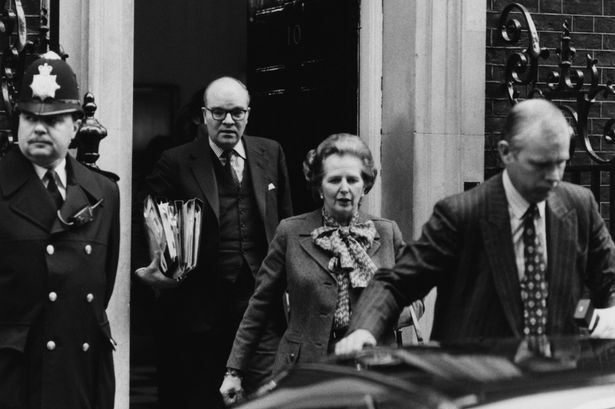 Ian Gow follows Margaret Thatcher in 1984. He was assassinated by the IRA six years later. This entry was posted in History, Northern Ireland, Politics and tagged Ian Gow, IRA, Margaret Thatcher on June 17, 2016 by admin.